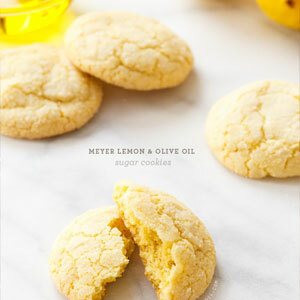 These soft and chewy sugar cookies are made with a secret ingredient: Meyer Lemon Infused Olive Oil. The resulting cookies have a candy-like lemon flavor and a subtle hint of olive oil flavor shining through. They are surprisingly buttery for a cookie made with no butter at al (in fact, these cookies are naturally dairy free). In a bowl, sift together flour, baking soda, baking powder, and salt. Set aside. In a second large bowl, combine sugar and olive oil and mix with a spatula until it forms a grainy paste. Add eggs and vanilla and stir until smooth. Fold in the dry ingredients until just incorporated. You should have a fairly soft, oily dough. Fill a small dish with more granulated sugar. Scoop dough by the tablespoonful into balls and roll in sugar to coat. Arrange on a nonstick or parchment-lined baking sheet, leaving 2 inches of space between cookies. Bake for 11 to 13 minutes or until tops are puffed and crackly and edges just start to turn light golden brown. Let cool for 5 minutes before transferring to a wire rack to cool completely. Cookies are best enjoyed the day they are made, but will keep in an airtight container for up to 3 days. Variations: While we loved the candy-like flavor from the Meyer Lemon Infused Olive Oil, the Blood Orange Infused Olive Oil or even a fruity extra virgin olive oil (such as Arbequina) would work well too.